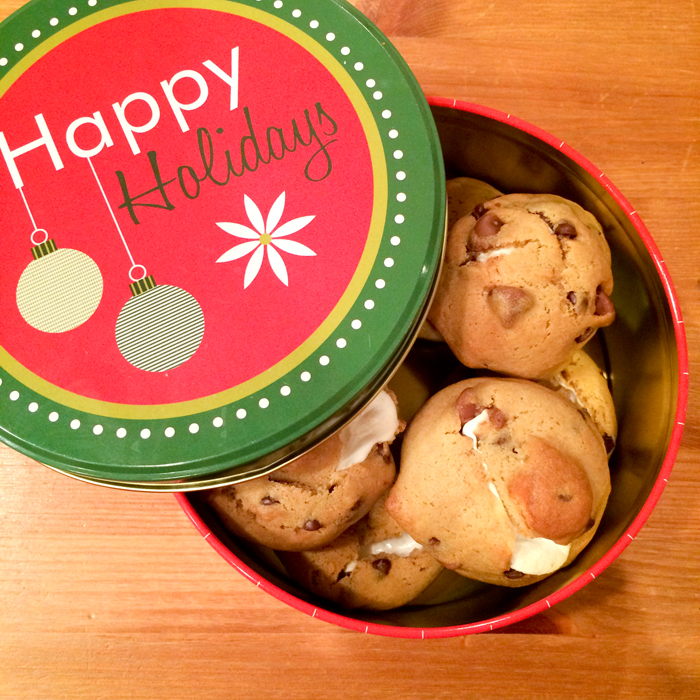 I am so excited for today's post because a) I haven't done a recipe in forever b) I've made everyone in my office try these and they all love them and c) this cookie exchange has been in the works for over a MONTH!! I've looked at everyone's cookies and holy moley there are some delicious looking treats about to come your way! Lots of family traditions, old recipes and fun stories. 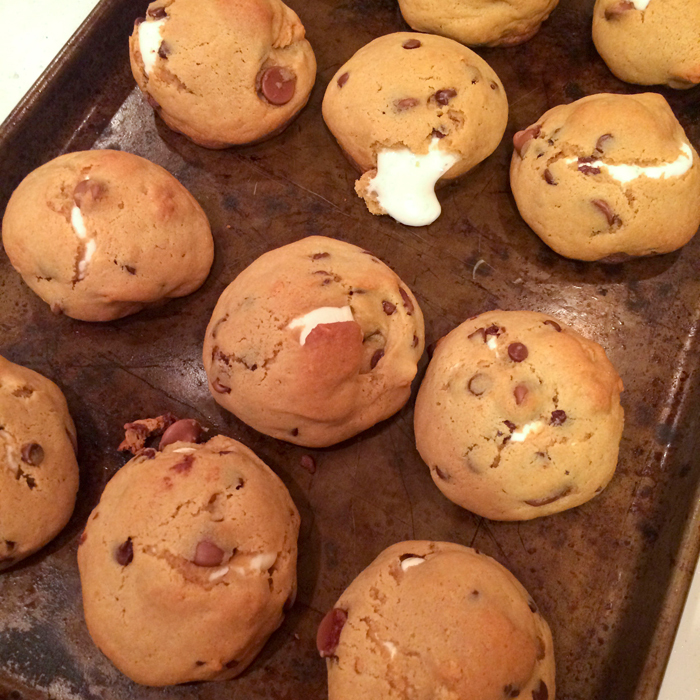 I wanted to make S'mores cookies because growing up I used to spend many winter nights hanging with my friends out in the country gathered around a bonfire. We would sit around the fire, laughing, talking, and making s'mores for hours. Some of my fondest memories are breaking out the "bonfire jacket" and knowing I'd be laying under the stars for a couple of hours. Oh the events that happened around that fire pit with a bunch of high school kids haha. Living in the city we don't exactly partake in many bonfires... this is my way of taking a s'more with me to work ;) It doesn't come with the smoke smell but it sure reminds me of some great times! Makes around 25-30 cookies - so share them! *This is important because other marshmallows will dissolve in the heat. 1. 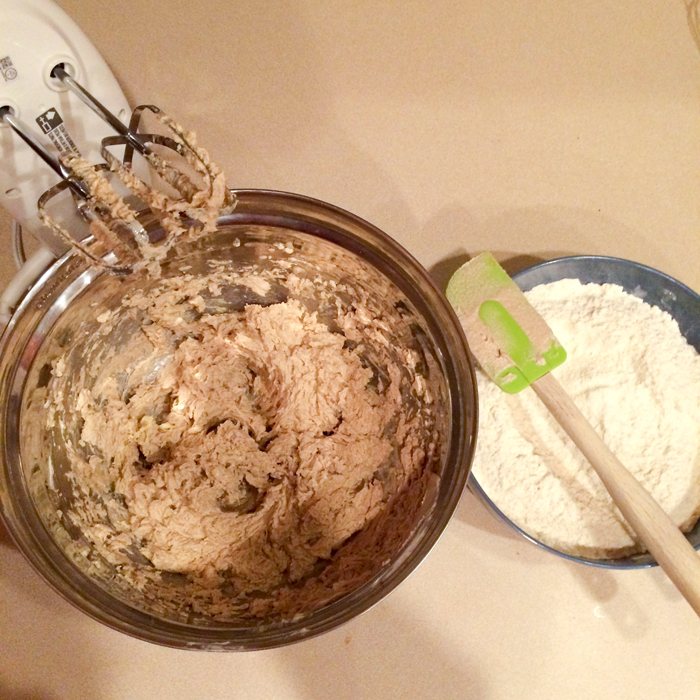 In a small bowl, combine the flour, salt, baking soda, and baking powder. Set aside. 2. Cream the butter for a minute or two, then pour in the sugar and mix until light and fluffy. Mix in the honey and then beat in the eggs. 3. 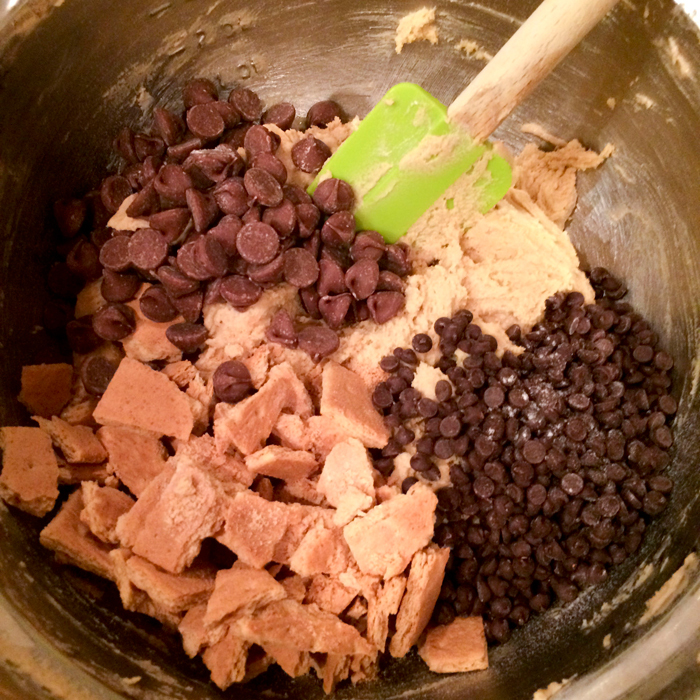 Gradually add the dry ingredients to the wet ingredients. Fold in the chocolate chips and then gently fold in the graham cracker pieces (you want to taste actual chunks of graham crackers). 6. 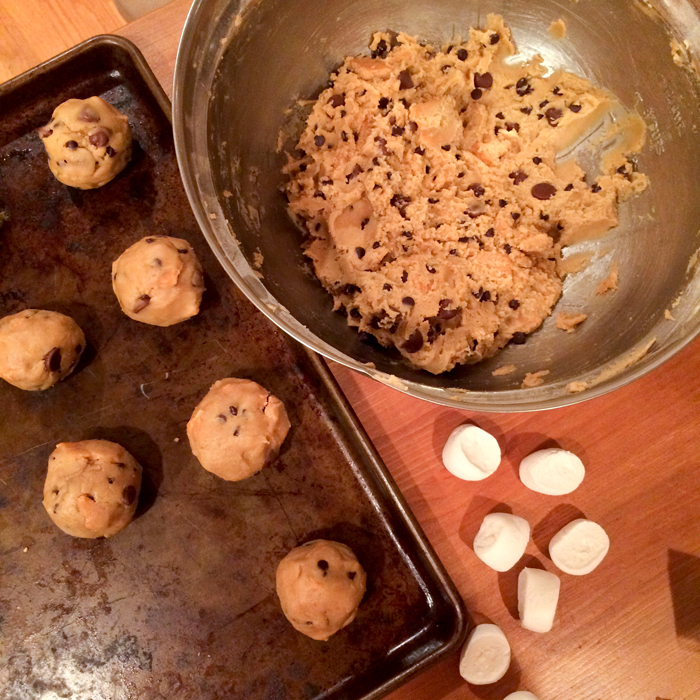 Scoop up a spoonful of dough, roll into a ball, flatten, and set down on a cookie sheet (lining with parchment paper is recommended). Set the marshmallow half right in the middle. Top with another spoonful of flattened dough and press together making sure all seams are closed. Cookie will be about the size of a golf ball. Repeat with the remaining dough. 7. Bake for 15-20 minutes, until the sides are gold brown. 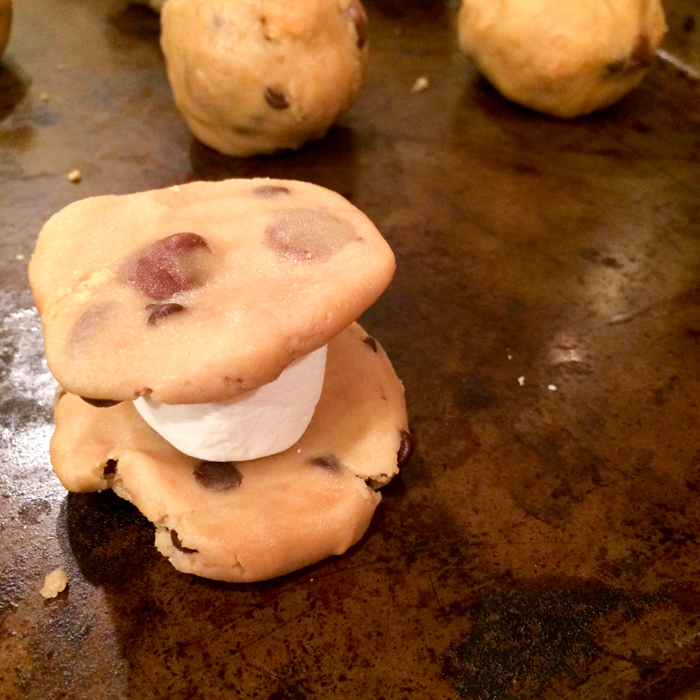 (Some cookies may puff up a bit in the oven - that's because the marshmallow is expanding. Don't worry, it's okay!) Let sit on the cookie sheet for a minute or two and then transfer to a cooling rack. (Doing this quickly will help the marshmallow keep it's expanded shape instead of collapsing on itself). 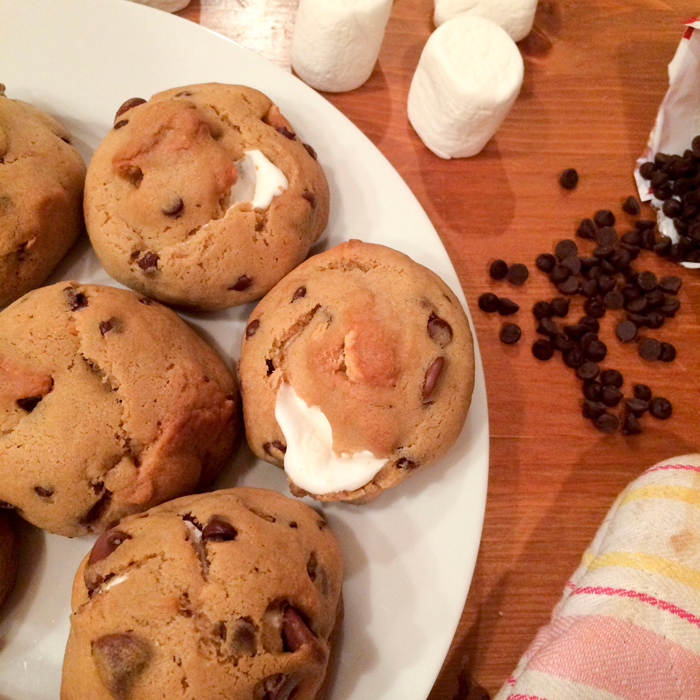 10 of us have bonded together to share our favorite holiday cookie recipes! 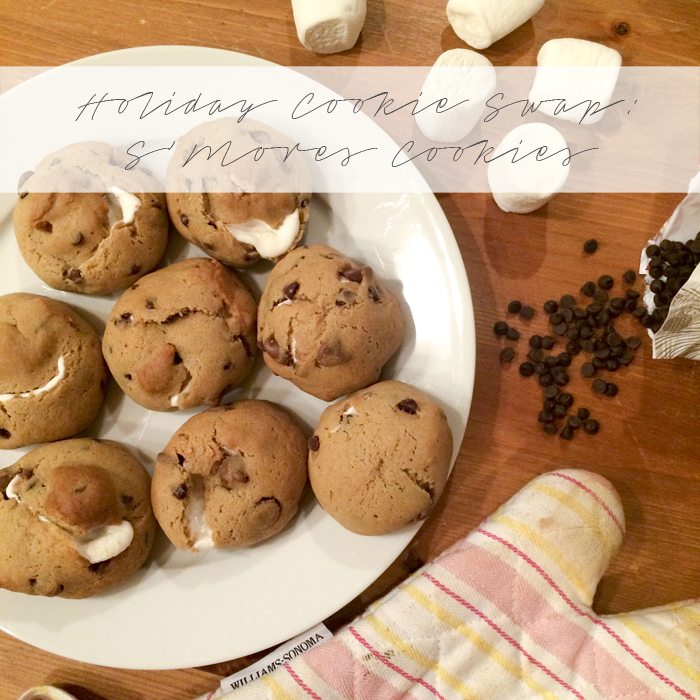 If you've been following along on the cookie exchange circle be sure to head to Jenna's blog, Lilly & Grant next! 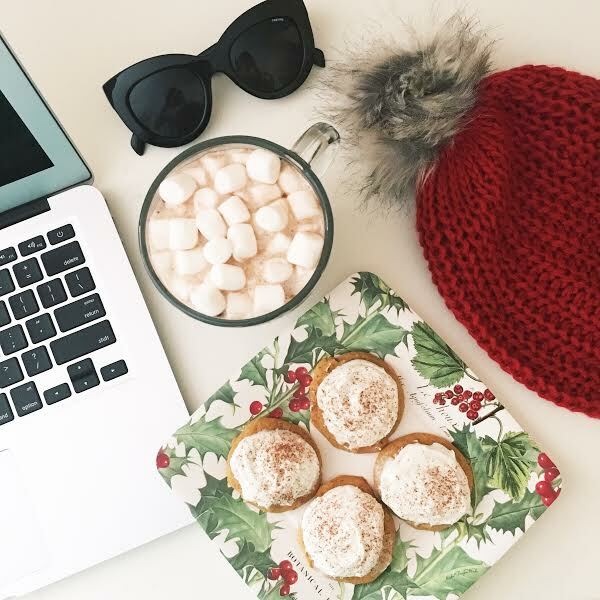 Thanks to all of the blogger's participating in today's cookie exchange! It's been a fun month planning with you ladies. Can't wait to make everyone's holiday cookies! YUM YUM YUM!! These look amazing!! I can't wait to try out this recipe! Those look so yummy!! I did that same cookies swap but the one in Canada!! This looks delicious. I love cookies.